There’s nothing spectacular about the Nissan Rogue. However, even though it’s a somewhat pedestrian compact crossover sport utility vehicle, it’s the top-selling vehicle in the Nissan fleet. How popular is the Rogue? Extremely popular. In 2018, Nissan reported sales of 412,110, the most since the Rogue debuted in fall 2007. Those numbers were no fluke. The 2017 Nissan Rogue had sales of 403,465. The Rogue possesses most of the key qualities that car buyers desire in a small crossover SUV, delivering an upscale cabin with good comfort, spacious room for five occupants, excellent cargo space, and an alluring sticker price. It doesn’t seem to matter that the Rogue’s overall performance is lacking and several competitors provide a better driving experience. Two years ago, the Nissan Rogue received a refreshing that enhanced its appeal. The biggest addition was adding a hybrid model in addition to its three trim (S, SV and SL). Although possessing the general characteristics of the traditional Rogue, the hybrid’s gas mileage (31-37 mpg) is quite impressive. As mentioned, one thing that no model in the Rogue lineup delivers is performance. One of the longtime knocks on the Rogue is its uninspired power – and nothing has changed. Performance is average at best. The Rogue lacks adequate power on any sizable hill and isn’t too hot from a starting point either, clocking an unimpressive 0-60 mph in 9.3 seconds. The standard 2019 Nissan Rogue engine is a 2.5-liter, inline-4 that generates 170 horsepower and 175 pound-feet of torque, and gets 25-33 mpg. It’s paired with a continuously variable transmission (CVT) that directs the power to the front wheels. The hybrid model features a 2.0-liter, inline-4 with 176 horsepower. Power might be lacking, but the Rogue does offer some other fine qualities. It has a quiet engine that elicits little road noise. This is an SUV that handles like a sedan, providing a smooth ride and efficient handling. The Rogue offers an overall feel of refinement and its braking is strong and firm, giving the driver a confident demeanor. One thing we didn’t realize about the Rogue was it can transport up to seven people when a two-seat third row is added. The third row is for kids only, but does give the Rogue something that competitors typically don’t offer. The third row is not an option in several models, including the hybrid. The Rogue features an attractive, comfortable cabin that employs quality materials, soft-touch surfaces, and lots of infotainment and connectivity features. The dashboard layout is smart and learning its nuances is fairly intuitive. Cargo area is 32 cubic feet and the space increases to 70 cubic feet when the second row is folded down. 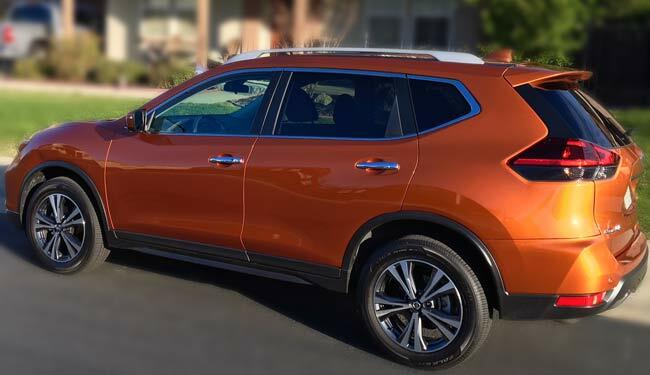 The 2019 Nissan Rogue is a competent compact crossover SUV that delivers in a number of key areas like cost, comfort and fuel economy. Overall, it’s a solid performer that deserve a look when out shopping for a small SUV. Performance: 2.5-liter, four-cylinder, 170 horsepower; hybrid 2.0-liter, four-cylinder, 176 horsepower.